Birmingham paralegal Felicity Rackstraw has ridden to the aid of the Department of Transport to help drive up awareness of its summer safety campaign which warns both motorists and bikers to look out for each other on the roads. 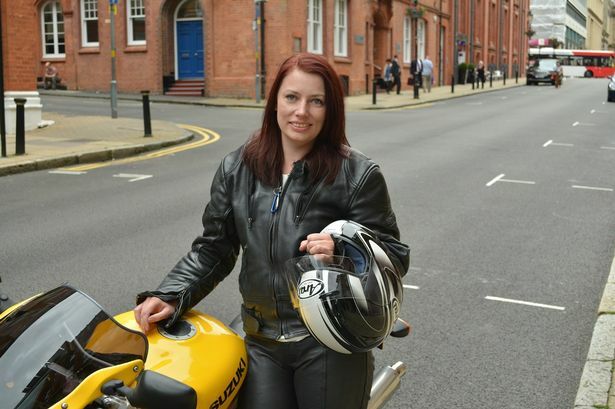 Ms Rackstraw, a paralegal at the national law firm Clarke Willmott, is a motorcycle fanatic. The 36-year-old, from Stoke-on-Trent, regularly commutes to work on her 1,000cc Suzuki and spends much of her spare time out on the road on two wheels. The &apos;Think Bike, Think Biker&apos; campaign is a cause very close to Ms Rackstraw&apos;s heart, having suffered a horrific bike accident in August 2010. The incident inspired her to fight for road safety improvements. Her story, crash and convalescence is now the case study for the Department of Transport&apos;s online campaign, running throughout August. As a former motorcycle training instructor, Ms Rackstraw had been out with a group of learner riders on the A50 near Burton-on-Trent when she was hit from behind by an inexperienced driver. She said: "We were on our way back from a training session and I had stopped at a roundabout. Unfortunately, the motorist behind me did not bother checking to see whether I had moved on and slammed into me, sending me and my bike flying across the tarmac." Ms Rackstraw suffered a fracture to her neck as well as injuries to her back and legs. Her 650cc BMW motorcycle was completely written off and the motorist who caused the accident received points on his licence and a fine, after agreeing to undergo driver retraining. She added: "My accident highlights the importance of making sure the vehicle in front of you has gone before ramming your foot down on the pedal. "I am excited to take part in this campaign; I have always been passionate about raising motorists’ awareness of motorcyclists." Motorcycle accidents typically rise in the summer months as more bikers take advantage of the warm, dry weather. Even though bikers represent only one per cent of road traffic, they account for 20 per cent of road fatalities. In 2013, 331 motorcyclists died and 4,866 were seriously injured in UK road collisions. Philip Edwards, a partner and road traffic accident legal expert who heads up the specialist serious injury team in the Clarke Willmott Birmingham office, said: "We are totally behind Felicity and the Department of Transport&apos;s campaign. "All too often I see the devastating consequences, when a family loses a loved one, or someone suffers life changing injuries as a result of a road collision and the high number of preventable accidents which lead to these events remains a national scandal."